Today, we are giving away a couple of cool T-shirts, Pens, Stickers and Phone/Card necklaces from Opera Software! All you have to do is retweet this post, as simple as that. Winners will be announced next Friday, so there is a plenty of time to do that. As retweets are scrambled, it does not really matter, whether you will be the first or last one to tweet. Opera Software Cheese Slicer (yes, you read it right), more shirts, pens, necklaces, 2GB USB key and sticky notes? Ask and answer questions at ask.favbrowser.com, receive points and redeem them for all those prizes! P.S. You get 100 points just for registration. 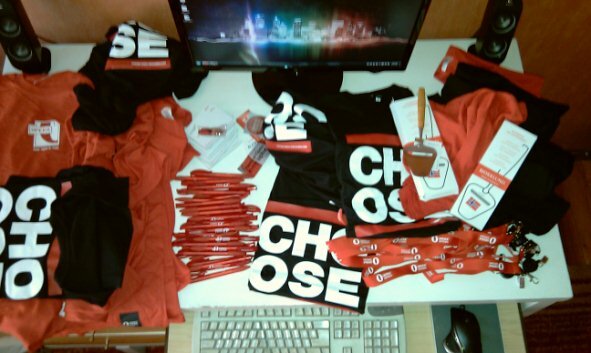 Thanks a lot to Opera Software and Espen André Øverdahl for all the goodies. But I can only get it from being active in ask.favbrowser.com? i so want a lanyard! Are those the x530 or the x540? mine are 540. Five from the…….. well you get the idea. Yep, it’s more than enough for the background music. I got no sicken 100 points. Did I? I earned those damn points with blood and tears. Haha, you did, actually. So tha’ts only 1658 points of blood and tears. Ill believe that I’ve earned em. Ohh and shipping to this place is hardly worth it. Save ur stamp. U in europe yerr. Ship it to Turkey. Going there near the end of the year. I generally find freebies like this to be rather lame. Would anyone actually wear an Opera shirt? I wouldn’t. I usually wear Opera shirt when working out (don’t worry, not this one). I SOO want this, so bad. Been an Opera fan and user since I first got a hold of the internet.